The very first Ferris wheel was built for the World’s Columbian Exposition in Chicago in 1893. George Ferris, an American engineer, was one of several engineers who were issued a challenge by the Fair’s directors: come up with a monument that would surpass the Eiffel Tower, which was the star of the Paris International Exposition in 1889. Ferris designed his giant wheel so those riding it would be able to view the entire exhibition. The original Ferris wheel had 36 cars and stood 264 feet. It took it nine minutes to make a full, non-stop revolution and could carry 38,000 passengers a day. The entire ride lasted 20 minutes and cost 50 cents per ticket. 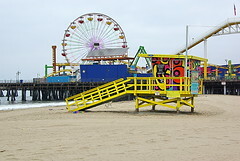 The Ferris wheel was dismantled and reassembled twice before being destroyed in 1906 and used for scrap metal. 5. Deno’s Wonder Wheel, Coney Island, NY: The Wonder Wheel is a New York landmark that was built in 1920. Located in Brooklyn, the Wonder Wheel has a perfect safety record and it only stopped once – during the Great NYC Blackout in 1977. Navy Pier is 150 feet high. It is modeled after George Ferris’ first wheel and provides amazing views of Lake Michigan and the Chicago skyline. 3. Pacific Wheel, Santa Monica, CA: Want to see the beautiful Southern California coastline from 130 feet above the Santa Monica Pier? Even if you aren’t on the Pacific Wheel, it is a beautiful sight – this is the world’s only solar-powered Ferris wheel, with more than 160,000 energy-efficient LED lights. In the evenings, this 85-foot-tall wheel is a spectacular kaleidoscope of color. 2. SkyWheel, Myrtle Beach, SC: To experience the tallest Ferris wheel on the east coast and the second-tallest Ferris wheel in the US, jump aboard the 200-foot-tall SkyWheel. Unlike a traditional Ferris wheel, the Skywheel features 42 glass-enclosed, temperature-controlled gondolas, each with room for six people. 1. Texas Star Ferris Wheel, Dallas, TX: The Texas Star Ferris Wheel is the largest Ferris wheel in North America and one of Fair Park’s most popular attractions. From 20 stories up, visitors can sometimes see the downtown Fort Worth skyline – 40 miles away. There’s nothing quite like sitting high above the world at the top of the Ferris wheel, enjoying the complete quiet and the amazing scenery spread below, waiting as passengers are loaded and unloaded … that moment of being suspended in time, just before the ride starts up again and descends slowly back to earth. It’s no wonder people have been enjoying George Ferris’ efforts since 1893. He wanted to “out-Eiffel” the Eiffel Tower, and in doing so he created an American classic – no matter where the wheel turns.